More than 200 million years ago, crocodiles roamed the Earth among the dinosaurs, and their skulls alone measured approximately six feet in length. Today’s crocodile began evolving 80 million years ago, developing the traits that have enabled its survival. While body armor of bony plates comes to mind, this rough and tough exterior is only the beginning. A combination of physiological and behavioral adaptations has ensured the crocodile’s survival through the ages. As the largest members of the reptile world, crocodiles are cold-blooded. They are ectotherms, meaning that they must seek out warmth to maintain their body temperature. Crocodiles can be found sunbathing when climate temperature is too cool, and basking in rivers when they become too warm. Crocodiles are able to regulate their own metabolic rate merely by engaging in these warming and cooling practices. When ideal body temperature is maintained, their metabolism slows to the point where food is not a daily requirement for survival. Crocodiles have the ability to forgo a meal for months at a time as most of their food intake is efficiently metabolized and stored, conserving the crocodile's energy for other purposes. On average, a crocodile dines on 50 feasts per year. 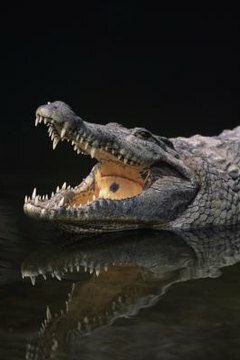 Crocodiles have extremely indiscriminate palates, and so their digestive system has adapted to process anything they consume, from crustaceans, mollusks and fish to birds and mammals. The acid level in their gastric secretions is the highest of all vertebrates. As bones, hooves, horns, shells and other solid materials get broken down, these rock-like items aid in grinding down coarse food. No matter what the crocodile chooses off the menu, none of it goes to waste. With the most highly developed and complex brains of all reptiles, crocodiles possess keen awareness and a strong learning ability. Their heightened auditory and olfactory senses forewarn them of dangers and guide them toward prey. To enhance their underwater visual capacity, a protective membrane covers their eye. The iris of their eye achieves optimal night vision. They learn to avoid repeated threatening situations by navigating new routes after a single perilous encounter. This has thwarted numerous attempts of their capture by human beings. Crocodiles are a living link to the dinosaur age, and their survival has come so far. Despite the crocodile’s adaptations for surviving through millions of years, the U.S. Fish and Wildlife Service now lists the American crocodile as an endangered species. Their critical population reduction is the result of illegal poaching and habitat depletion by man’s encroachment on their turf. Enforcement of laws against hunting, environmental awareness education and habitat expansion are steps that are currently underway to preserve the crocodile for millions of years more.